Here is another incredible ELLO S Sub Ohm Tank by Eleaf that is ready to show you a good time. When you attach the ELLO S Atomizer to your mod, you will almost automatically see the difference when it comes to vaping. 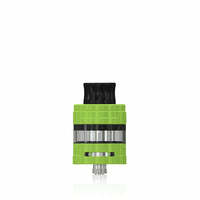 This spectacular atomizer is going to give you the ability to fill up the tank with 2ml of e liquid of your choosing. Filling it up when you use up all of the 2ml of e liquid is not going to be difficult either due to the top fill system. The powerful coils in this atomizer are going to enhance the flavors of your e liquid and even help you in enjoying several huge clouds. For those of you cloud chasers, you should probably consider getting your hands on this impress piece. The adjustable airflow will work wonders assisting you in introducing a certain amount of air into every pull that you take. This atomizer is easy to clean, so do not even sweet thinking it will be a drag when it needs a little scrubbing. This is an excellent atomizer that should only be used by individuals that love friendly clouds. Your clouds are going to go from simply being big to loud and obnoxious.